Alongside their evolving commentary on universities and professions, the U.S. News & World Report recently released a ranking of the “Top 35 Diets,” with input from 22 health experts. In first place was the “DASH Diet” – a government-endorsed “dietary approach to stop hypertension;” followed by the TLC Diet, a Therapeutic Lifestyle Changes plan created by the National Institutes of Health; and the Mayo Clinic Diet, which explains how to make healthy eating a lifelong habit. Lower on the list are diets created and endorsed by weight loss companies (Jenny Craig, Weight Watchers) and lower still are the Vegetarian Diet, Vegan Diet, Raw Food Diet, and Paleo Diet. The amalgam of competing voices reflected in these different guidelines – medical institutions, commercial entities, and nostalgic homages to the way our species has fed itself – embody the complex and heterogeneous landscape of health and dietary advice in the 21st century. Journalistic exposés on the gluten-free dietary trends sweeping the globe, bestselling books by physicians, reactions to the USNWR rankings, and the rise of anti-obesity campaigns all reveal the current focus on locating sources of authority in matters of diet, health, and lifestyle. But the hierarchy of authority in deciding what is healthy or “natural” to eat has never been stable. In the U.K., the lines between “medical” and “popular” advice on healthy eating were in constant flux for years after the 1858 creation of the General Medical Council (GMC) – the body vested with the power to award and rescind medical licenses. In the mid-1800s, the term “naturopath” was applied to individuals who thought drugs were toxic, and believed that a “natural” diet was the pathway to health. When the GMC revoked the license of naturopath T.R. Allinson, they made it quite clear how the medical profession felt about this diet-based approach. The story of Thomas Richard Allinson, who lost his medical qualifications but gained a health food empire, serves as an invaluable window into the intersections of nutrition, health, and dietary authority at the turn of the nineteenth century. His legacy continues to hold particular relevance because Allinson’s Bread remains popular in the U.K. today: the brand is now part of Associated British Foods, which in 2013 represented 32 percent of the bread market. Understanding Allinson’s strategies with regard to marketing and medicine can help us frame and evaluate the various claims made in the present about healthy, natural diets and lifestyles which bombard us each time we open the internet or turn on the television. Dr. T.R. Allinson. ©Edinburgh University Library Center for Research Collections. Allinson had trained and been granted a medical license by the Royal College of Physicians in Edinburgh in 1879. But soon after leaving Edinburgh, he rapidly decided drugs and medications were toxic, and launched a hygienic health movement promoting “right living.” Right living meant following a vegetarian, wholemeal bread-based diet devoid of alcohol, caffeine, and tobacco. It also meant rejecting all drugs and medication. In 1892, the GMC revoked his qualifications on charges of “infamous conduct in a professional sense,” condemning his shameless self-promotion and denigration of fellow physicians (or “professional poisoners,” as he called them). 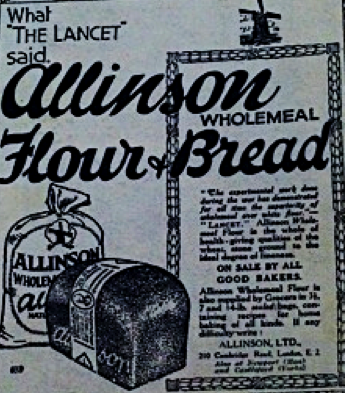 Upon the virtues of wholemeal bread, Allinson built a health philosophy that he promoted through diverse avenues: medical columns and correspondence in The Weekly Times and Echo (he served as medical editor for 26 years); bread-baking competitions and vegetarian feasts for the poor; widely-circulated pamphlets and books; a Hygienic Hospital created to test and promote his methods; and most importantly his Natural Living Company and its food products. In Allinson’s time, lively debates abounded about the harm in removing nutrients from grain, the differences between white and brown bread, and the threat of adulteration with chemicals used to whiten bread. These fears influenced Allinson’s choice of slogan: his product was the “Bread wi’ nowt taken out,” and always bore the Allinson seal and windmill icon. Capitalizing on associations between bread and heartiness, contentedness, and natural harmony, Allinson built his philosophy of health on the merits of wholemeal bread (made from whole grains of wheat), prescribing it as the primary component of every diet, and even subsisting on just bread and water for one month in what could only be categorized, in modern terms, as a publicity stunt. Early 20th century advertisement of Allinson’s products. ©Edinburgh University Library Center for Research Collections. Disease really is a variation of the body from that state which constitutes health, and is an accommodation to circumstances; the ultimate aim of nature being health, or as near an approach to it as possible. He thought that with a sufficient amount of “vital force,” all organs would function harmoniously. However, “if we are living incorrectly some organs abstract more than their share and others have to go short.” Health was attainable through an ascetic vegetarian, bread-and-fruit based diet accompanied by regular exercise, fresh air, and abstention from the “poisons” that “drug doctors” prescribed in the form of medications. In Allinson’s Weekly Times and Echo columns, he prescribed wholemeal bread to almost every type of patient as one of several lifestyle changes, whether the correspondent suffered from vertigo, cancer, or halitosis. It wasn’t until later in the nineteenth century that salaried researchers began working within the confines of well-established scientific, medical, and pharmaceutical enterprises—with roles emerging especially for research into the newly-discovered entities known as vitamins. In Allinson’s era, the designated occupation, qualifications, and roles of nutrition experts were very much in flux, and when Allinson deviated from the allopathic ways of the GMC, he embraced commercial strategies to spread his vision. Allinson addressed long-distance “patients” via his column in the Weekly Times and Echo, repeatedly touting the same tenets. Allegedly by popular demand, Allinson penned a series entitled “How I Live,” which meticulously detailed his routine. He outlined his habit of rising between 7 and 8 am, letting fresh air “sweeten the sheets and destroy all effluvia,” washing his hands and face, and vigorously rubbing his body with a towel and getting “into a glow.” He also described his exercise, dining, and sleeping habits, to the point where one could visualize and emulate his every move. In many cases, it seemed like this vision of health as a routine to follow, a leader to imitate, and a set of rules to live by was just what the public wanted. Although it is difficult to verify the existence of all the Weekly Times & Echo readers who wrote to Allinson, the testimonials he approved (or invented) mimicked his language and style – and external sources verify that some of these individuals did in fact exist. H.C. Long wrote in 1900 that “I can go for a five mile walk and then enjoy my Weekly Times and Echo, Shakespeare, Darwin’s Origin of Species, and so on,” lumping Allinson’s gospel with two of the most canonical authors in the English-speaking world. Allinson encouraged readers to write in with their experiences and opinions on his regimen: and write they did. In magazines beyond the Weekly Times and Echo, readers proudly proclaimed that they were raising “Allinsonian children” who were “brought up on Dr. Allinson’s principle” and who had never ingested a medication. Photos were supplied of these ruddy, thriving youngsters – the poster children of the Allinsonian Way. One eager reader wrote to Allinson with her plans to open a Vegetarian hygienic boarding school that followed his lifestyle recommendations, while others founded an “Allinsonian Society” in 1888. In this way, Allinson’s followers became and created new vehicles for promoting his products and practices. Parents showcased their “Allinsonian children” in Children’s Realm magazine. ©Edinburgh University Library Center for Research Collections. Allinson also ran into trouble with the law. In May 1990, a Coroner assessed Allinson’s degree of responsibility in the death of 10-month-old Dorothy Cole, the daughter of a gasfitter, who died of malnutrition after having been fed exclusively on Dr. Allinson’s Natural Food for Babies and Invalids. 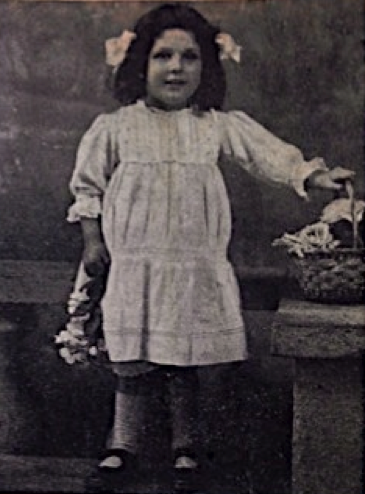 The court ultimately found Dorothy’s parents guilty of neglect. Allinson was also questioned about the death of Madame Getrude Guillaume Schack of Surbiton Hill, a German-born women’s rights activist, who passed away after accepting Allinson’s recommendation to do nothing but follow his diet as treatment for her cancer. 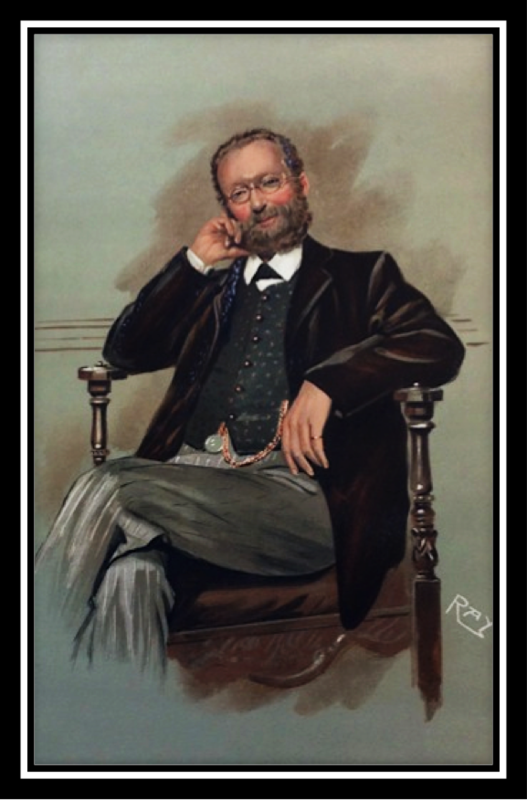 In 1895, Allinson had begun using the prefix Ex-L.R.C.P., a title which both revealed that he had been trained in the allopathic tradition and then rejected it, and been rejected by it. After confirming Schack was aware that Allinson had been de-licensed, he was exonerated from charges related to her death. Although the GMC utilized the only tool it had to curb the influence of Allinson’s naturopathic views on diet and health, Allinson’s impact was far from constrained. He used outlets that are common today – media, advertising, public appearances, personal endorsements – to promote a vision of health and nutrition that made sense to him, made him rich, or some combination of the two. Today, Allinson’s legacy continues to evolve: on the website for Allinson’s Wholemeal Bread, the founder is portrayed as a misunderstood pioneer whose ideas about nutrition, hygiene, and smoking (he wasn’t a fan) were ahead of his time. Allinson was not the first to build a following based on testimonials and advertisements, but his navigation of the boundary between allopathic and naturopathic medical authority provides an opportunity to carefully examine the strategies that appealed to the public – and why – in an era before evidence-based medicine was a concept or goal to the extent it is today. In an age of uncertainty with regard to health authority, many individuals were willing to embrace Allinson’s formulaic, reproducible health program. They absorbed Allinson’s strategies and made them their own, enabling the continued spread of his message and products, despite the negative press he received throughout his career. This infamy, in turn, underscored Allinson’s status as a boundary-crosser, and facilitated critical debates. Allinson’s total rejection of medicine may have fallen out of fashion, but his appeals to natural living have not, and it is useful to think critically about the messages propagated and tactics engaged by competing authorities catering to a public determined to find the recipe for a healthy life. After graduating from Harvard in 2013, Julie Barzilay continued her study of the history of science as a Masters student at the University of Cambridge. She was the Science Editor of The Harvard Crimson, and has recently enjoyed telling stories about the history of climate change, children’s science literature and alternative medicine at the turn of the century. She loves communicating about science, and is now working as a science/health journalist while she applies to medical school. For an article on gluten-free trends, see http://www.newyorker.com/magazine/2014/11/03/grain. For physician-authored dietary books, see http://www.wheatbellyblog.com., for USNWR ranking reactions, see http://www.npr.org/blogs/thesalt/2015/01/06/375387779/from-paleo-to-plant-based-new-report-ranks-top-diets-of-2015?utm_source=facebook.com&utm_medium=social&utm_campaign=npr&utm_term=nprnews&utm_content=20150106, for anti-obesity campaigns see http://www.letsmove.gov. 16-Dec-1888, Weekly Times and Echo (WTE). Edinburgh University Library Centre for Research Collections (EULCRC): MS 3187. Allinson, Hygienic Medicine, 1887: 18. Vincent, David. Literacy and Popular Culture. Cambridge: Cambridge University Press, 1989:167. Allinson, Ltd., Now to Reap your Harvest. Extracts from the Essays of T.R. Allinson, 2007.